MKSK celebrates with Nationwide Children’s Hospital for its honor of winning the 2017 James B. Recchie Design Award. The award in recognition of James B. Recchie, a founding trustee of the Columbus Landmarks Foundation, is given to a single project for excellence in Urban Design reflected in historic or new buildings, public spaces, parks, or art. MKSK along with our colleagues at OLIN are proud to have been an integral part of this prestigious project and the talented team of FKP Architects, Ralph Applebaum Associates, EMH&T, HAWA Incorporated, Horton Lees Brogden Lighting Design, Jezerinac Geers & Associates, Irrigation Consulting, Inc., and Turner/Smoot. MKSK celebrates with Nationwide Children’s Hospital for its honor of winning the 2017 James B. Recchie Design Award. Nationwide Children’s Hospital has been an integral part of Columbus’ South Side community for over 100 years. The new hospital serves the needs of hospital patients, their families, and the medical staff. Additionally, the hospital's impact on the surrounding community is through its Healthy Neighborhoods Healthy Families (HNHF) initiative and its neighborhood impact on affordable housing, education, health & wellness and workforce development has had many positive effects on Columbus’ South Side community. The project also physically integrates open space along Livingston Avenue with one of Columbus’ oldest parks, Livingston Park. This creates a space for patients to experience outdoor-healing as well as a place for those in the surrounding community to explore. 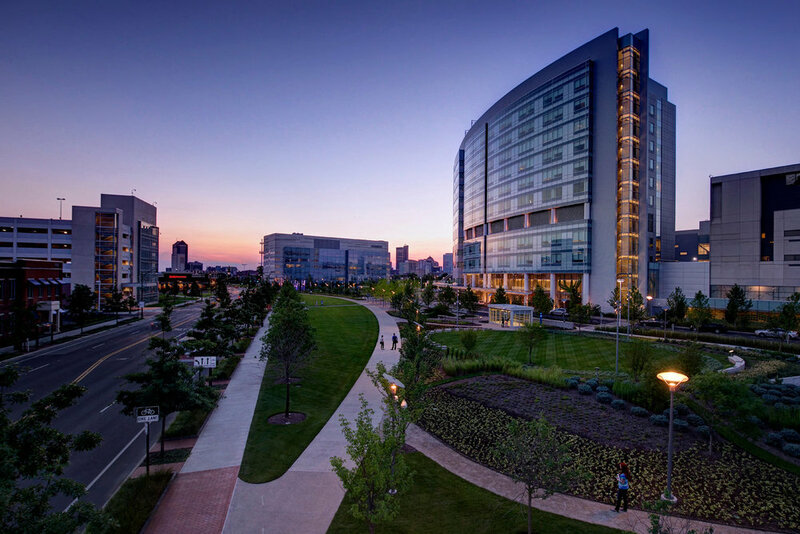 Through the creation of therapeutic public open space, with direct links to the surrounding neighborhood, Nationwide Children’s Hospital has set a new pediatric hospital standard for ‘Healing and Community’. This creates a space for patients to experience outdoor-healing as well as a place for those in the surrounding community to explore.